Here, we report our experience of using IV LEV in critically ill children. This study is a retrospective case series of critically ill children who received IV LEV for the treatment of ARS or SE at our hospital between January 2011 and August 2014. Electroencephalography (EEG) was performed on critically ill patients who were kept in the ICU to exclude nonconvulsive seizures or nonconvulsive SE. We reviewed the medical records of those patients, retrospectively. Clinical and laboratory data such as age, gender, seizure type, etiology, mental retardation, neurologic deficits, previous history of epilepsy, the dosage of LEV, duration of therapy, side effects, length of ICU stay, number of oral AEDs, concomitant AEDs, and drug interactions obtained from neuroimaging findings, EEG findings, treatment response, renal and liver function test results, and hemogram were recorded. ARS was defined as repeated myoclonic, clonic, tonic, or tonic-clonic seizures (each seizure lasting less than 5 min with recovery of consciousness between each seizure) that had persisted for at least 30 min irrespective of whether they had been treated with any emergency medication (benzodiazepine alone or benzodiazepine with either phenytoin or phenobarbital) or not. Convulsive SE was defined as a single and prolonged tonic-clonic seizure that had persisted for over 5 min irrespective of whether the child had received any emergency medication or not. Response to IV LEV was defined as complete termination of the seizure. Successful termination of the seizure was defined as occurring when all convulsive activities stopped within 10 min of completion of the infusions and did not recur within the following 24 h.
In our pediatric ICU, IV midazolam and diazepam are administered to individuals with ARS as the first step of treatment. If the seizures are not stopped even after this treatment, one or more of the second-line drugs, such as phenobarbital, phenytoin, valproate, and LEV, are used. LEV is preferred as the first treatment option in patients with coexisting comorbidities such as respiratory depression, cardiac arrhythmia, hepatic failure, and thrombocytopenia. Dosage of LEV was adapted to renal function, that is, it was reduced to 50% and 30% in the cases of clearances <30 mL/min and 10 mL/min, respectively. Maintenance dosage reduction is recommended in patients with renal impairment. IV LEV was infused with a loading dose of 10 mg/kg or 20 mg/kg over a period of 15 min depending on the child neurologist's instruction. The children underwent cardiopulmonary monitoring during the treatment. The serum LEV concentration could not be performed in our hospital. One hundred eight children were identified who received IV LEV for the treatment of SE or ARS in the pediatric ICU. The mean age of the patients was 69.39 ± 46.14 months (1-192 months). Of these 108 patients, 58 (53.7%) were boys and 50 (46.3%) were girls. Generalized and focal seizures were identified in 71 patients (65.7%) and 37 patients (34.3%), respectively. The mean IV LEV loading dose was 28.33 ± 4.60 mg/kg/dose (10-40 mg/kg), the mean IV maintenance dose was 33.7 mg/kg/dose (20-40 mg/kg), and the median IV treatment period was 3-5 days (2-5 days) for LEV. Forty two patients (38.9%) who presented with SE or ARS were also diagnosed with epilepsy before LEV was administered. Sixty three patients (58.3%) were given LEV as the first treatment option, and 45 patients were administered IV phenytoin. We reviewed side effects in only three patients (2.8%). Agitation and aggression were developed in two patients, and mild erythematous rash and urticaria developed in one patient after IV LEV. Good response to LEV was detected in 79 of 108 patients (73.1%). The demographic details of these patients are summarized in [Table 1]. SE is one of the most common neurological emergencies. The neurological morbidity rate of pediatric patients with SE has been shown to be as high as 57%, and the mortality rate has been reported to be as high as 32%. , Therefore, phenytoin has been commonly used in patients with SE or ARS, which has numerous side effects that reduce its usefulness in critically ill patients. The treatment agents such as midazolam, pentobarbital, high dose of phenobarbital, propofol, inhaled anesthesia, and/or ketamine, that can induce coma and help in achieving anesthetic effects, are commonly used for refractory SE. However, these medications necessitate long-term mechanical ventilation and increase the risk of complications, such as hemodynamic instability and metabolic disorders, that arise from the treatment. Studies are underway to investigate the effects of newer IV AEDs such as valproic acid and LEV. , Several studies suggest that IV LEV can be used successfully in patients with SE unresponsive to benzodiazepines or other initial therapy. , Kim et al. reported cases of seizure termination in 6 (43%) out of the 14 patients with SE. Two other previous studies, Kirmani et al. and Gallentine, have reported that IV LEV treatment controlled seizures in 46.8% and 66.7% of children with SE, respectively.­ , We detected seizure termination in 46.3% of the patients with SE in our study. It should not be a surprise to note that LEV is used in the setting of seizure prevention or seizure treatment in patients with central nervous system (CNS) malignancies. Depending on the type and location of tumor and the age of the patients who are diagnosed with CNS malignancies, chance of developing seizures can vary from 20% to 45%. Some authorities suggest the use of LEV or gabapentin can be used as a first-line therapy for the treatment of seizures in patients with brain tumors. , We used IV LEV in four patients with brain tumor and their seizures were well controlled. A large case report in critically ill adults suggested LEV monotherapy was associated with fewer complications compared with other AEDs, especially phenytoin. Recently, there are reports that LEV may be safe and effective for treating SE and ARS in children. ,,, Nau et al. reported no adverse hemodynamic events or cardiac arrhythmias in their study. Goraya et al. observed no serious adverse effect in 10 children treated with IV LEV. İşgüder et al. described side effects such as agitation and aggression in 3/133 patients. We found agitation and aggression in two patients, and mild erythematous rash and urticaria in one patient. LEV was discontinued in those three patients, and their symptoms were resolved. But, we detected no interaction with other AEDs and medications. In conclusion, LEV appears to be safe for critically ill patients in children. Future prospective studies should compare LEV with conventional AEDs, such as fosphenytoin, in terms of safety and efficacy in treating critically ill patients. Ramael S, Daoust A, Otoul C, Toublanc N, Troenaru M, Lu ZS, et al. Levetiracetam intravenous infusion: A randomized, placebo-controlled safety and pharmacokinetic study. Epilepsia 2006;47:1128-35. Varelas PN, Spanaki M. Management of seizures in the critically ill. Neurologist 2006;12:127-39. Yu KT, Mills S, Thompson N, Cunanan C. Safety and efficacy of intravenous valproate in pediatric status epilepticus and acute repetitive seizures. Epilepsia 2003;44:724-6. Pellock JM, Glauser TA, Bebin EM, Fountain NB, Ritter FJ, Coupez RM, et al. Pharmacokinetic study of levetiracetam in children. Epilepsia 2001;42:1574-9. Goraya JS, Khurana DS, Valencia I, Melvin JJ, Cruz M, Legido A, et al. Intravenous levetiracetam in children with epilepsy. Pediatr Neurol 2008;38:177-80. McTague A, Kneen R, Kumar R, Spinty S, Appleton R. Intravenous levetiracetam in acute repetitive seizures and status epilepticus in children: Experience from a children's hospital. Seizure 2012;21:529-34. Incecik F, Hergüner MO, Altunbasak S. The efficacy and side effects of levetiracetam on refractory epilepsy in children. J Pediatr Neurosci 2012;7:19-22. Sisodiya SM, Sander JW, Patsalos PN. Carbamazepine toxicity during combination therapy with levetiracetam: A pharmacodynamic interaction. 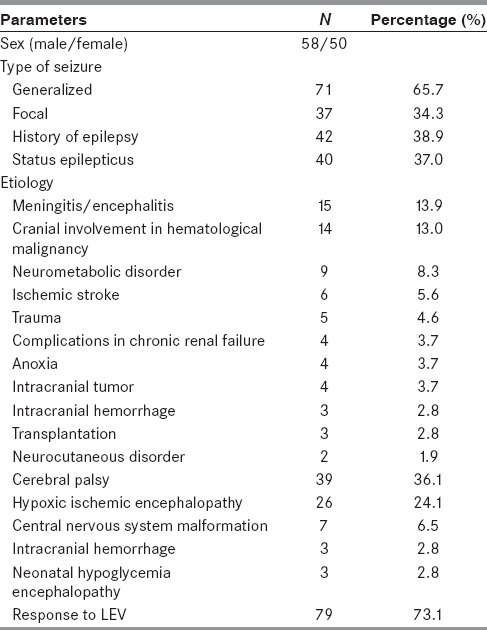 Epilepsy Res 2002;48:217-9. Parentelli AS, Phulpin-Weibel A, Mansuy L, Contet A, Trechot P, Chastagner P. Drug-drug interaction between methotrexate and levetiracetam in a child treated for acute lymphoblastic leukemia. Pediatr Blood Cancer 2013;60:340-1. Khan O, Chang E, Cipriani C, Wright C, Crisp E, Kirmani B. Use of intravenous levetiracetam for management of acute seizures in neonates. Pediatr Neurol 2011;44:265-9. Reiter PD, Huff AD, Knupp KG, Valuck RJ. Intravenous levetiracetam in the management of acute seizures in children. Pediatr Neurol 2010;43:117-21. Haberlandt E, Sigl SB, Scholl-Buergl S, Karall D, Rauchenzauner M, Rostasy K. Levetiracetam in the treatment of two children with myoclonic status epilepticus. Eur J Paediatr Neurol 2009; 13:546-9. Milligan TA, Hurwitz S, Bronmield EB. Efficacy and tolerability of levetiracetam versus phenytoin after supratentorial neurosurgery. Neurology 2008;71:665-9. Usery JB, Michael LM 2 nd , Sills AK, Finch CK. A prospective evaluation and literature review of levetiracetam use in patients with brain tumors and seizures. J Neurooncol 2010;99:251-60. Abend NS, Monk HM, Licht DJ, Dlugos DJ. Intravenous levetiracetam in critically ill children with status epilepticus or acute repetitive seizures. Pediatr Crit Care Med 2009;10:505-10. İşgüder R, Güzel O, Ağın H, Yılmaz Ü, Akarcan SE, Celik T, et al. Efficacy and safety of IV levetiracetam in children with acute repetitive seizures. Pediatr Neurol 2014;51:688-95. Gilbert DL, Gartside PS, Glauser TA. Efficacy and mortality in treatment of refractory generalized convulsive status epilepticus in children: A meta-analysis. J Child Neurol 1999;14:602-9. Kim JS, Lee JH, Ryu HW, Lim BC, Hwang H, Chae JH, et al. Effectiveness of intravenous levetiracetam as an adjunctive treatment in pediatric refractory status epilepticus. Pediatr Emerg Care 2014;30:525-8. Kirmani BF, Crisp ED, Kayani S, Rajab H. Role of intravenous levetiracetam in acute seizure management of children. Pediatr Neurol 2009;41:37-9. GallentineWB, Hunnicutt AS, Husain AM. Levetiracetamin children with refractory status epilepticus. Epilepsy Behav 2009;14:215-8. Yap KY, Chui WK, Chan A. Drug interactions between chemotherapeutics regimens and antiepileptics. Clin Ther 2008;30:1385-407.
van Breemen MS, Wilms EB, Vecht CJ. Epilepsy in patients with brain tumours: Epidemiology, mechanisms, and management. Lancet Neurol 2007;6:421-30. Kutlu G,Gomceli YB,Unal Y, Inan LE. Levetiracetam monotherapy for late post stroke seizures in the elderly. Epilepsy Behav 2008;13:542-4. Khongkhatithum C, Thampratankul L, Wiwattanadittakul N, Visudtibhan A. Intravenous levetiracetam in Thai children and adolescents with status epilepticus and acute repetitive seizures. Eur J Paediatr Neurol 2015;19:429-34. Rüegg S, Naegelin Y, Hardmeier M, Winkler DT, Marsch S, Fuhr P. Intravenous levetiracetam: Treatment experience with the first 50 critically ill patients. Epilepsy Behav 2008;12:477-80. Nau KM, Divertie GD, Valentino AK, Freeman WD. Safety and efficacy of levetiracetam for critically ill patients with seizures. Neurocrit Care 2009;11:34-7.